wheres waldo, originally uploaded by jahansell. I'm sure there's some obvious reason why this pond in Millerton (behind the veterinary/Hylton Hunt Salon) isn't iced over. The geese don't care why, of course - they're just glad to have some open water. When I went there I spooked them - you can see they're heading into the water and swimming away from me. 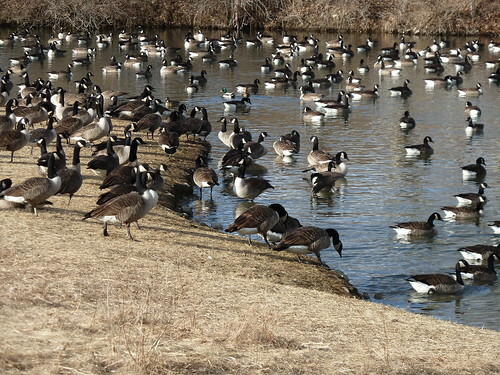 I thought there were only geese (and this is just a small fraction of the total spread out on the field to the left and the pond to the right) but if you look closely you can see someone else in the picture!